While floating homes have been the norm in the Netherlands for many years, they’re just starting to gain in popularity in the UK. Houseboats are increasingly dotting the Thames in London, and waterborne developments are currently in the works for post-industrial areas of Glasgow and Liverpool. Now one company—SRT EcoBuild—is looking to establish a village of floating homes in the waterways of Leith, Edinburgh. These modest, energy efficient two-bedroom homes will utilize solar power and sell for significantly less than homes of an equivalent size in the ever-pricey Scottish capital. Tom King, Managing Director of SRT EcoBuild explained to the Scotsman “Our vision is to create low-carbon, energy- efficient homes on either land or on water, and in the waterways of Leith we believe we have found one of the most attractive sites for our project.” Located in the former commercial quays, it would utilize the waterways in North Edinburgh and potentially assist in the further revitalization of the neighborhood. While we haven’t seen detailed plans for the homes, a YouTube video by the company provides renderings and some information for what appears to be the same (or similar) 10 meter by five meter floating homes. The proposed homes are to be powered largely by powered by solar, with heat provided by air-source heat pumps and will also utilize rainwater harvesting to help bring them close to self-sufficiency. To minimize impact on and disruption to the local environment, they will be constructed offsite. And the homes could be significantly cheaper than explained to the Edinburgh News that while mooring costs may apply, the fact that no land needs to be purchased helps to keep the costs of the homes down to around £95,000. This stands in sharp contrast with the current prices for a two bedroom home in Edinburgh, which stand at around £150,000-£200,000. 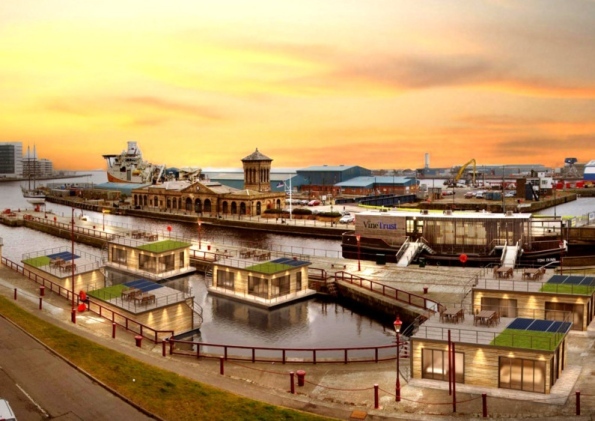 Unlike ZM Architects‘ plans for Glasgow, King’s village would have little impact on the land, and would require “minimal” moorings. As such, Edinburgh must still determine what, if any, planning permission restrictions would apply to the project. Once that is resolved, King hopes to have the first SRT EcoBuild home, in which he himself will live, afloat by the end of the year. While floating homes have been the norm in the Netherlands for many years, they're just starting to gain in popularity in the UK. Houseboats are increasingly dotting the Thames in London, and waterborne developments are currently in the works for post-industrial areas of Glasgow and Liverpool. 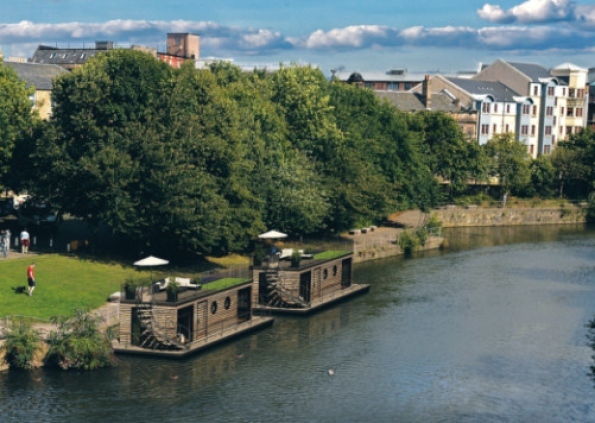 Now one company—SRT EcoBuild—is looking to establish a village of floating homes in the waterways of Leith, Edinburgh. These modest, energy efficient two-bedroom homes will utilize solar power and sell for significantly less than homes of an equivalent size in the ever-pricey Scottish capital.